In companies / firms / organizations, Accountants prevent their data to share or altered from anyone. Accountant of those firms not give access to other users to make changes or display the voucher entry or statutory details in the Company Data. 2. On Screen of “Gateway of Tally” Press Alt + F3 & Select Security Control - Types of Security. 4. Follow below steps & Save the details “Acccept”. 5. After that, Select Users & Password from Security Control option. You can see the additional Security Level (which was created by you) is showing there. 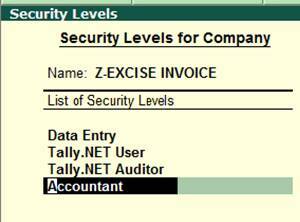 Select “Accountant” as Security Level, Enter user name (accounts) as you wish, enter password (accounts) & Save the Details. 1st password is for full access of your data i.e. 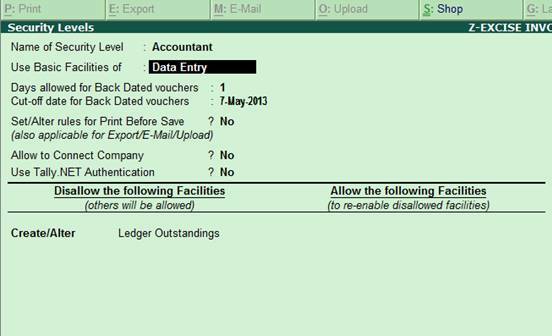 only for you to open, create, alter, display, print, all features access in this user id. And 2nd is for disable all above features which is used in user id 1. A more best knowledge see below video.